[Semi-resolved] How to create a marauder from scratch? There seem to be no clear guide as to how to do this properly, and I end up with either the custom marauder doing the correct animations but no sound, or no sounds or animations at all. And in all instances, the attacks always come from one side or from the center of the marauder. Here is how I have this set up in the data editor. What's really irking me is that I can NOT get the launch and impact sound effects to attach to the unit no matter what I do. I already know I need to go into the actor's events and modify them to specify my custom weapon for attack animations, but for the life of me I can't figure out why there is no sound and the missiles are launching from the wrong place(s). Your Action type actor is not set up correctly. The left-right weapon firing is caused by an Attach Method of the Pattern type which uses the Launch Missile effect under the Basic: Driver field. You need to put this under the Combat: Launch Attachment Query - Methods field. I assume you have your impact sound set under the Combat: Impact Map - Sound field in the None category and your launch sound in the Combat: Launch Asserts - Sound field. This means you probably have not linked the Damage effect to the Action Impact action under the actor events. Also double check the effect being used to create the actor. Could you provide screenshots marking the fields I need to alter and where? 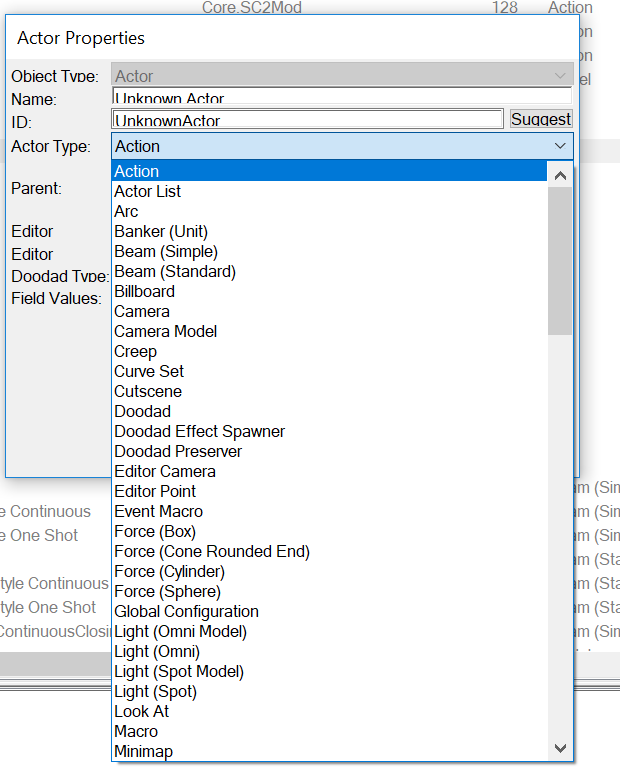 Because I cannot find what you mean by "Attach Method", "Pattern" type or the "Basic: Driver" field on the action actor. The impact map is set up exactly the same as the default marauder. What do you mean by "check the effect being used to create the actor"? There is a data type called Attach Methods which are put under the Combat: Launch Attachment Query - Methods field of the Action type actor. I assume you have set the launch missile effect being used to create the actor to that of your unit. Based on the screenshots provided, did I find the Attach methods in the right place? You mean the entry I called "Leon Launch Missile"? I provided screenshots already to show how I've set it up. Sorry if I missed it but I did not notice a picture of the attach method. Under the Pattern type attach method you need to specify the ID of the effect used to change the attachment. So I will need to create my own data entry of "pattern" type (like I would an actor or unit) and copy it from the marauder's pattern so I can assign the effect to it without affecting the default marauder? EDIT: I guess that isn't a thing. Anyways, is this what you're referring to when you say "Pattern type attach method"? That is the right field to select your attach method but you need to create one under the Attach Methods data type. It is under the Actor category of the data editor just beneath the Actors data type. Within data types you can get multiple different sub types. When creating an entry in the data editor you get to select the type beneath the ID field in the properties window. Just for your information there are 111 different types of actors although a lot of them are site operation actors. With your marauder you are using a Unit type actor for the visuals of your unit and an Action type actor to control the attacks. Which one of these do I select? Because Attach Method isn't an option. That picture is of an entry from the Actors data type you want the Attach Methods data type which is a different tab. Press the little green + sign and open the Attach Methods tab. I have found it! Sorry, I've just never heard of this section of the data editor before. Though I also realize that creating an Attack actor copied off the marauder breaks the vanilla marauder's attacks as well (no sound, grenades only coming from one side, etc). I created a new Attach method and applied it thusly, but in testing, there is still no sound (and there are still incorrect launch points of the missiles) from either my custom marauder or my vanilla marauder. Are the missiles coming from a wrong attachment point or are they coming from the feet and hugging the ground (even over cliff)? Edit: You also did change that final actor event of the Action actor to use your launch missile effect and not the default marauder one right? They are launching from between the feet, yes, as well as hugging the ground even when over a cliff. And I did change the action actor to use the custom launch missile effect. Ok that means the Action actor is failing to be created. I see you have not got a blank in the Art: Beam field. That would explain the error. The art:beam was there by default (even in a default map that the editor opens) for the marauder. I set it to blank but the whole problem with the missile launching from the model origin and hugging the ground still occurs. Unfortunately I can't upload more screenshots to show you. Odd, if you set the Art: Beam field to default and the Art: Missile field to the Missile actor used by the ammo unit for the Launch Missile effect it usually fixes the issue. Also what tech level are you using? Tech level? What does that mean in terms of the editor? The Action actor for the marauder has a Validate Effect term based on a Player Requirement validator that uses a Requirement that counts the Punisher Grenades upgrade. This is used to disable one Action actor and enable a different one. So is the Art: beam field set to the parent value (grey) and the Art: Missile field set to the Missile actor of your Launch Missile effect? Action actors do not work if there is a perceived entry in both the Art: beam and the Art: Missile fields. Up in the original post you can see in the picture titled "LeonEvents" how I have the actor events set up. Art:Beam is set to the default parent value. Art: Missile is also set to use the default value copied from the original marauder. You can see how I have it set up in "LeonLaunchMissile" for the effect and you can see how I have the attack actor set up in "LeonAttackActor" both in the first post. In a later post you can see that I changed the effectLaunch field on the bottom right to correspond with the ID of my custom launch missile entry (which I had to type in manually). The biggest thing for me right now is getting the sounds to work, and I have no idea how the custom attack actor is set up that disables sound on the default marauder as well (even though I have touched nothing on it). Also, in-game, it gives me "cActor events" errors about Leon and the Marauder saying it can only create one actor or something.